The Japanese CDI has a different CDI than any of the unrestricted specifications of RC30. The following should help immensely if you are trying to determine what CDI is in your motorcycle: If you can add to, clarify, or correct anything that follows I am open to constructive suggestions. Note that JDM represents Japanese Domestic Market. These Japanese home market machines are limited to 77 PS. I have added some information on how to de-restrict the Swiss CDI unit. The CDI Unit controls the ignition advance and provides a trigger signal for the tachometer. The JDM CDI also receives a signal from the speedometer. Hmm, that wouldn't be a Japanese government mandated sensor, would it? If you scrap the wheezy JDM muffler, jets and airbox you must also change the CDI. At time of typing this the unrestricted CDI units were still available from Honda. The RC30 CDI is pretty simple in today's world but back in 1987 an 8 bit microprocessor with a bit of in chip memory was de rigeur for a street bike. Has two connectors. One to the main harness (pulse generator outputs and tach trigger) and one to the converter (power and signals). Has tamper-proof white tape on one end. Has a rivet holding the unsealed plastic cover on. Has a weatherproof bootie (HRC/NL0 CDI only). 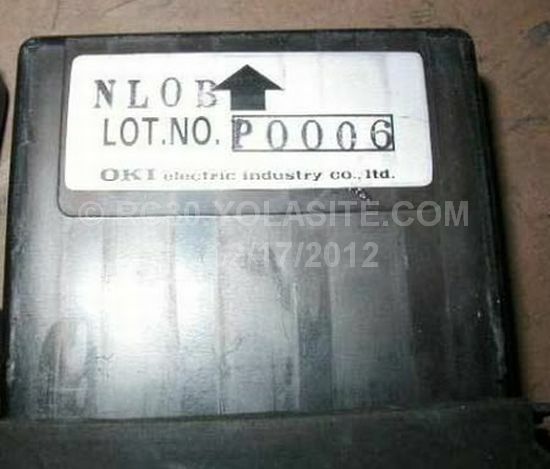 Is made By OKI Electric. Is quite heavy due to the necessary contsruction..
Is hermetically sealed, making it essentially tamper-proof, and quite robust. Is the same for restricted and unrestricted specifications. Both of the above pictured CDIs are unrestricted versions. On the left is a new, unrestricted CDI which I purchased from Honda. 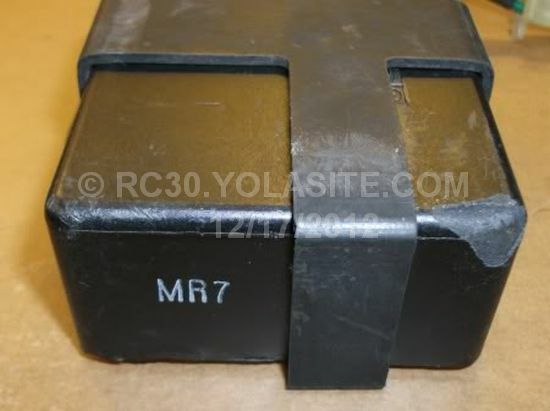 The unrestricted CDI part number is 30410-MR7-600 as shown on the box. The important thing to look for is the "B" after the number 503. This "B" indicates an unrestricted CDI. The CDI box on the right is a used one also showing 503B1. Again the B designator indicates it is unrestricted. 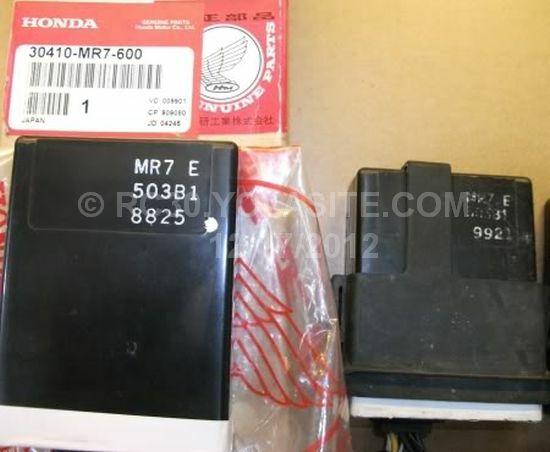 The MR7 code is obviously Honda's code for the RC30. I am unsure of what the E just to the right of MR7 represents. The JDM/restricted CDI units have nothing in that location for a code. I speculate E probably represents Europe or England. The left CDI's numeric code of 8825 indicates manufacture on August 25, 1988. The CDI on the right was made September 21, 1989. There is a letter used in the second from left digit on some CDIs. This letter represents a month; X=October, Y=November and Z=December. Above is a picture of another unrestricted CDI from my own bike (a 112 hp machine). The May 19th 1988 manufacture date is appropriate for this bike. The white splotch beside the date code is a quality control mark from the OKI factory. Now I'll show how to detect a restricted JDM CDI unit. There is no way to practically de-restrict a JDM CDI unit. If you want a proper advance curve and eliminate the speed restrictor you will need to replace it. 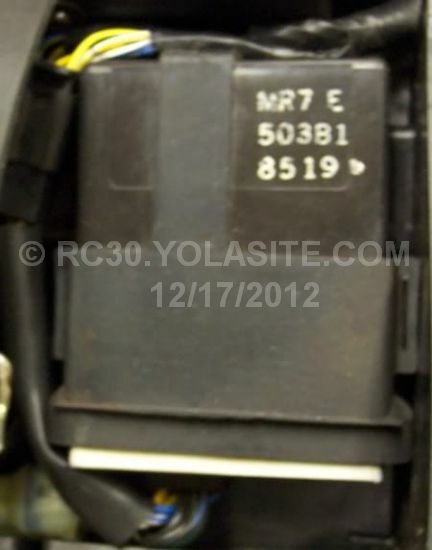 The above picture shows a brand new JDM CDI unit which is part number 30410-MR7-000. The easiest way to tell if your machine is still equipped with one of these is to look at the letter code after the number 503. All JDM restricted CDIs have the letter A after 503. If someone has been sneaky and rubbed off the letter A you can still positively identify one of these units. The plug that connects to the main wiring harness will have all six pins in the plug in use. An unrestricted CDI only uses five of the six pins. The additional wire is colored pink. 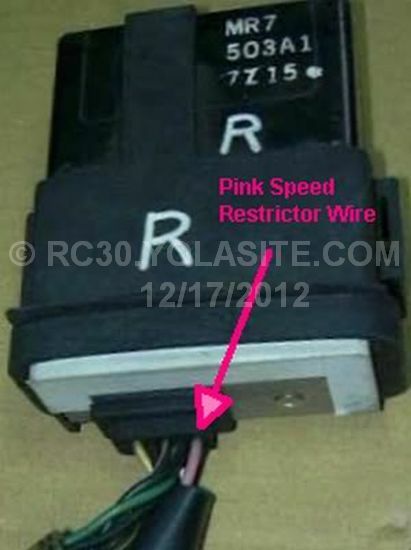 This wire carries a trigger signal from the speedometer speed restrictor. 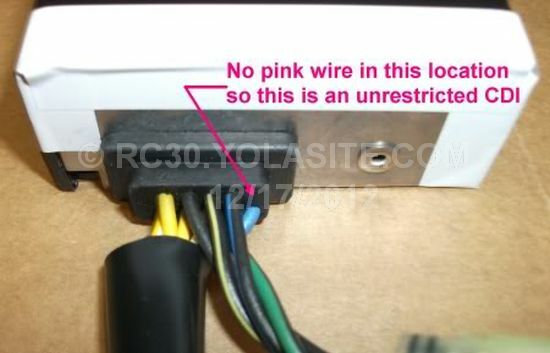 You can just see this pink wire in the images that follow. Another, less conclusive, method of determining what CDI you have is to look at the date code. The JDM ones that I have seen have all started with, logically, a "7" in the date code. Though difficult to see in the above image the date code on the new JDM CDI is 7922, representing Sept 22, 1987. The above two CDI units are from JDM machines. 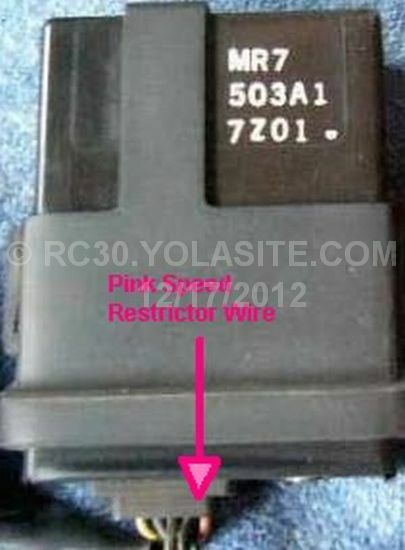 Note the pink wire, letter code A and the dates of manufacture of December 1987. Above is an unrestricted CDI merely showing the open/blank spot in the molded rubber where the pink JDM restriction wire would be. This wire is conspicuous by its absence. Note though that the Swiss CDI will be blank here also. 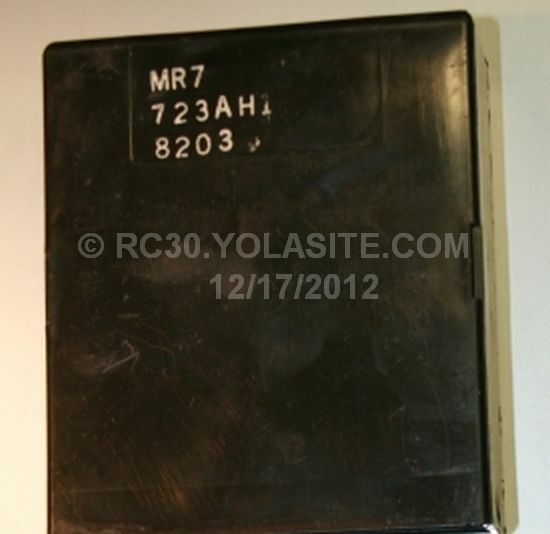 If you have the code 723AH1 on the cover then continue reading below. I received some information on the Swiss spec CDI unit and how to derestrict it. I obtained this information from a site visitor so I can’t personally confirm it works. I don’t have a Swiss CDI to do this. He says it removes the rev-limiter and permits 12,700RPM operation. In addition to derestriction you will see an empty spot for a wiring harness wire to go to. This would be the wire from the speedo restrictor if it was a JDM CDI. The image is of a Swiss CDI so the spot sits empty. You can also see some capacitors missing on the circuit board. 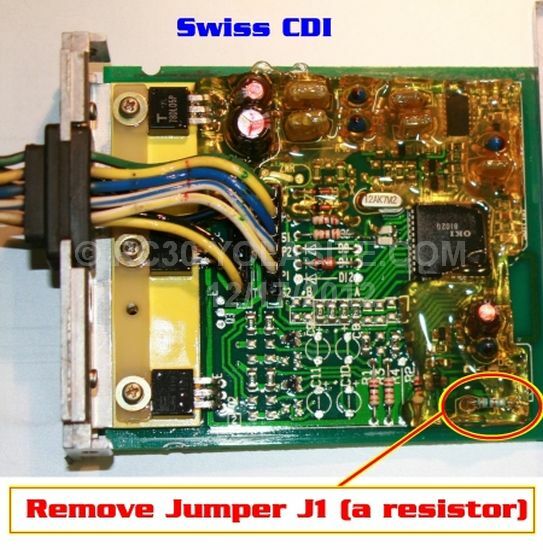 Honda uses the same circuit board for all CDI units in the RC30. The wiring, components soldered to it, and the ROM memory dictate what spec it is. You will have to remove the CDI cover. It is held in place by a rivet. If you don't know how to remove a rivet there is a description in the HRC kit manual (I am not kidding). After the cover is off you need to cut the leads from the resistor located in jumper J1 (remove the resistor/jumper from the circuit). You could just cut one lead and bend the resistor out of the way also. That way you won't lose the resistor when you want to again restrict it when your friends take it for a ride. A Swiss CDI has the code as indicated in the picture 723AH1. The Swiss CDI code - 723AH1. Made on Feb 3rd, 1988. The other black box is the digital converter. These units are all identical in an RC30. The JDM, European, Swiss etc converters are all identical. It is not necessary to change the converter box when de-restricting your RC30. The following two pictures show a standard RC30 converter. Even with a chunk missing this one still works fine. They are pretty tough. As with any electrical component the connectors are the problem most of the time. Contact cleaner is recommended for any used electrical parts. Better yet is disassembly of the connectors for cleaning. The underside of the CDI converter. We haven't a clue what the numbers mean on these, good thing they are all the same from country to country. 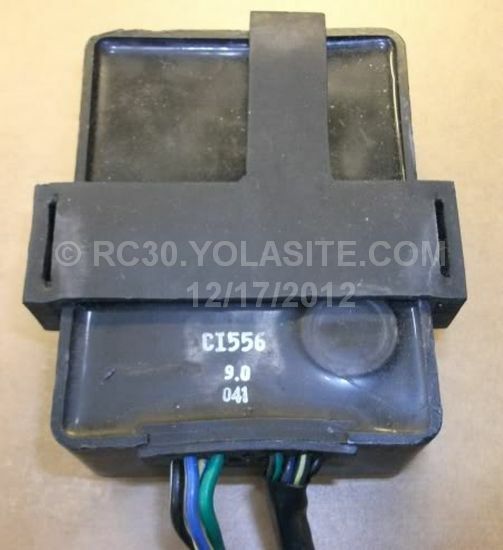 HRC sold their own CDI's for the RC30. 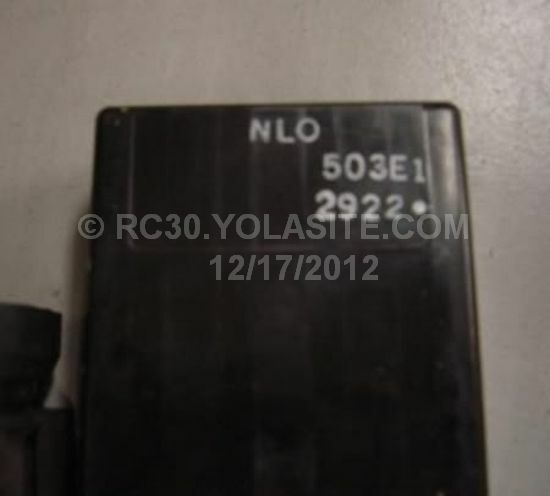 The HRC CDI is part number 30400-NL0-000 for all kits from 1988 to 1991 so it appears they never altered the standard customer kit CDI. 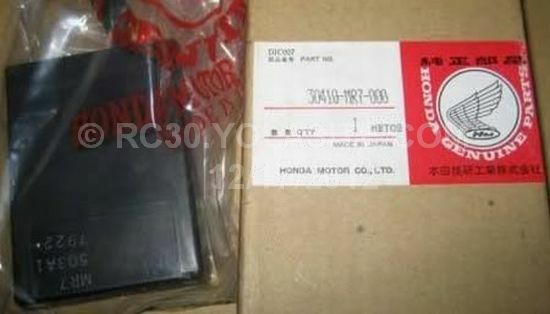 Below are a few HRC kit or Honda R&D CDI units for reference. Looks like an early NLO model CDI. 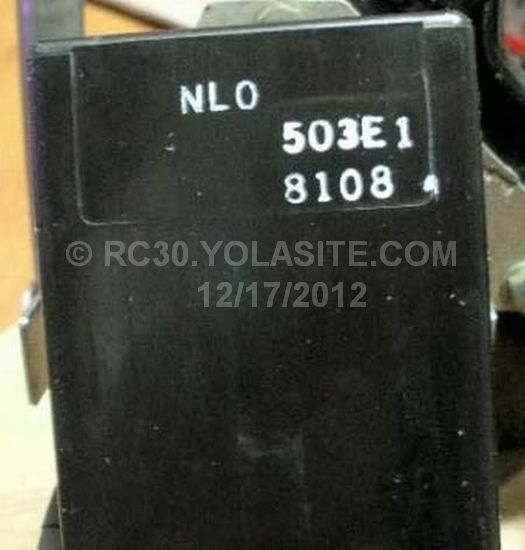 Looks like a later NLO model CDI, that is the same part number as the one above it. The above two CDIs are for works or semi-works NL0B engines. If you have something like this it would be best to test it. Your bone stock RC30 may not tolerate a 14,000 RPM rev limiter too well, if it doesn't detonate itself to death first. Comments, improvements, suggestions or corrections?